An experimental drug derived from marijuana just passed another critical hurdle toward being approved to treat certain kinds of epilepsy. A phase 3 trial reported Monday found that the drug, Epidiolex, was more effective at reducing the number of seizures in patients with a type of epilepsy called Lennox-Gastaut Syndrome. The drug reduced the number of seizures in a month by 44%, compared to those taking a placebo medication that reduced seizures by 22%. Lennox-Gastaut Syndrome is a rare form of childhood-onset epilepsy that’s associated with multiple types of seizures. In March, a phase 3 trial also showed positive results of the drug in children with Dravet syndrome, a rare, lifelong form of epilepsy that begins in infancy. GW Pharmaceuticals, the company developing Epidiolex, was up more than 10% on Monday. If approved, it would be the first of its kind to win FDA approval for the treatment of rare forms of childhood epilepsy. 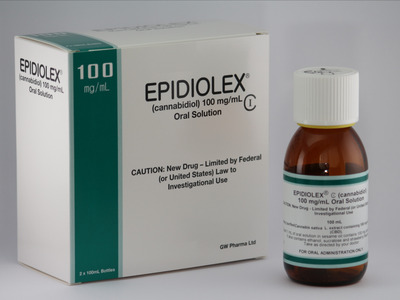 Epidiolex contains cannabidiol, one of the active chemical compounds found in marijuana. Unlike marijuana’s main psychoactive ingredient, THC, cannabidiol (or CBD) does not cause feelings of euphoria or intoxication, the characteristic “high” that is associated with pot. Cannabidiol has been linked for years with different kinds of pain relief and it was even studied in several clinical studies. Epilepsy affects roughly 4.3 million people, but the types of epilepsy and kinds of seizures that people with the illness may experience vary. That means not every person with epilepsy will respond to certain treatments, including those with cannabidiol. In addition to seeking approval for Dravet syndrome, Lennox-Gastaut syndrome, GW is also exploring cannabidiol for use in people with Tuberous Sclerosis Complex (a genetic disorder that causes tumours to form in various organs that can lead to seizures) and infantile spasms. GW is still exploring how well Epidiolex works in other types of epilepsy. The hope is that eventually, someone taking the drug would be able to either reduce the number of seizures they have, or even stop them entirely. But, with marijuana (and even just the cannabidiol component of the drug) available on a consumer market in states like Colorado, what’s the point of having a prescription version? GW’s Vice President of Investor Relations Steve Schultz said that the difference will be in the uniformity of the product. “The products that people are using, and purchasing, they’re artisanal products.” That means they can vary batch by batch, and can be influenced by different fertilisers or pesticides. GW’s version wouldn’t. “It will have the hallmarks of a true pharmaceutical medicine,” he said. Today, medical marijuana is legalised on a state-by-state basis. Getting it approved by the FDA as a prescription drug would require the DEA to reschedule it, since marijuana is currently considered a Schedule 1 drug with “no currently accepted medical use and a high potential for abuse.” The DEA is expected to make a decision regarding rescheduling by mid-2016. Epidiolex is not the first cannabis-derived drug that the company has brought to market outside the US. Sativex, a treatment for multiple sclerosis and pain related to some cancers, has been approved in at least 27 countries outside the US, but attempts to bring it to the US have fallen flat – the data wasn’t good enough to convince the FDA to give it approval. Schultz said the drug’s future in the US is still up in the air. GW plans to file for approval with the FDA by the end of the year.